Richard and Tanya Quilts: My Orange and Gray Needs a New Name! On the left is my Completed top on the right is my pattern. I have made a PDF pattern for this. One of my big goals this year is to share more of my patterns. Like the last pattern I would like comments either good or bad. I will not take a critical comment bad. I want to improve my patterns and I want comments from those interested. This pattern can be found here. 5 – 2 ½ inch squares in 33+ colors. 1 ¾ Yards for background color. 1 ½ Yards for the quilt back. Begin by gathering the 33 colors for you plus blocks. I suggest 33+ as when you are putting them together you may not like the colors that are getting grouped together and I would rather have some options to include or exclude a color depending how it looks. For my quilt I choose Orange, Yellow, and Red as my primary + blocks with Gray as my Background block. Other ideas would be pink and Grey, purple and gray, black and whites. I personally am a fan of orange and have more then 40+ different colors so that was my pick. Start by pining your 5 colors into stacks (just to keep you from misplacing them) throw them into a pile. Now grab 3 that you think would work next to each other and start laying them out on your sewing table or design wall. I used the above image as my guide for laying them out and I laid out just the Oranges (not the gray's) first making about 4-5 rows at a time and then sewing them together into strips. To make things go faster I chain sewed 2 side by side blocks then the next 2 for 4 or 5 rows worth. Then took the pairs of 2 and laid them back out again to make sure they were still all in the correct order. Then I sewed pairs of 2 blocks etc tell I had full rows. I then started sewing gray blocks together in the same fashion (looking at the image as a guide) then sewed them on each side of the rows. I then ironed each completed row and then sewed the rows together in pairs etc. Eventually you get done with the quilt top. Baste and quilt as desired. My plan is to echo quilt each seam. This will make a 36×48 inch quilt which would work as a great baby size, smaller lap quilt or even a wall decoration. Oh last but not least I need a good idea for a name for this quilt as Orange and Gray just wont cut it.! The quilt turned out really cool! It reminds me of DNA helix. What about Orange Helix? Not all that catchy a name, but cool, I think. I love this quilt and the contrast the oranges have with the gray. Very cool. I would call it "Pillar of Fire" since it's so striking. My first thought was DNA, as Ella said. I was thinking "Super Helix"
Nice quilt design. I also thought of DNA when I saw it. How about Dawn Twist for the name? If I made this quilt, the thing I would do differently is to use larger squares. But then, I guess that depends on how large a quilt you want to end up with! I think it looks like orange soda being poured; how about Orange Crush?! I LOVE it, btw - it's awesome. Olá Richard e Família!Passei para abraça-los.Amanhã é o DIA INTERNACIONAL DO ABRAÇO.Portanto sita-se abraçados todos.Beijos do Brasil. Your quilt looks great Richard. What about Orange Pop (as in soda pop. Is that what you call fizzy drink in America?). In Australia we would call it orange lemonade! Richard, I don't have a name suggestion, but I can tell you it is a beautiful quilt! The contrast of colors works perfectly and the pattern seems easy enough with your directions. Thanks for sharing them! looks great what about path of fire? When I saw that you were trying to find a name for this I thought "Orange Crush" - How bizarre that it has already been suggested. I love the colour combination in this quilt, it looks brilliant. My first thought was Double Helix, but I like the name Orange Crush better. I just thought of a name: Stairway to Heaven! I see someone already mentioned what I was thinking-Helix. I would just name it that and leave any color off of the name, that way people could change the color more readily than if it had a color specific name. This is looking great -- wonderful color scheme! I am *so* happy to have this pattern!! How about the name Calico Crosses? 'Orange Twister' or 'Twisted Addition' are options for a name. I would call it "On the plus side" because of all the lovely plus signs I see! How about "Up In Flames"? A lovely quilt! I wonder how you made the decision to use all 2.5inch squares. You could have made each cross out of one 6.5 inch strip and 2 2.5 inch squares. The grey could be all strips . 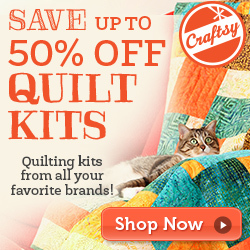 I guess I am a lazy quilter and would like to save all the effort of piecing all those identical pieces. Do you think that would be far less esthetically pleasing?